The airy experience of Alexander Asadov’s Aerohotel begins when you leave the mainland, gliding over the water in one of the island hotel’s designated airships. The hotel itself is so lacy and light that it seems to float high above the surface, letting the ocean and sky stretch out in all directions while having minimal impact on the environment. The Aerohotel is the latest concept design by Russian architect Asadov. A system of supports anchored to the ground keep the structure aloft while creating the impression that it would fly away if it weren’t tethered. Docks can be placed around the supports for boats, but the design includes landing strips for zeppelins to increase the ethereal experience of your stay. Light filters into the rooms and public areas from all directions, and the center of the hotel would feature not only shops and cafes, but also hanging gardens. Although the hotel is not currently in development, it has attracted a great deal of attention, especially from Arab investors. 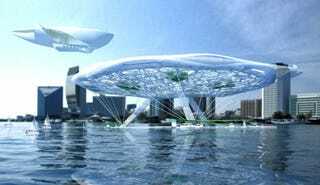 Because the Aerohotel support system requires very little subaquatic construction, it can be placed in any body of and does little to disrupt the environment below. As a result, it could prove a cost-efficient and environmentally friendly alternative to the man made islands that have proven so ecologically devastating.